The checklist is one of the coolest interactions that comes with Articulate Engage ’13. It’s interactive, which makes it so much more helpful and interesting for learners. 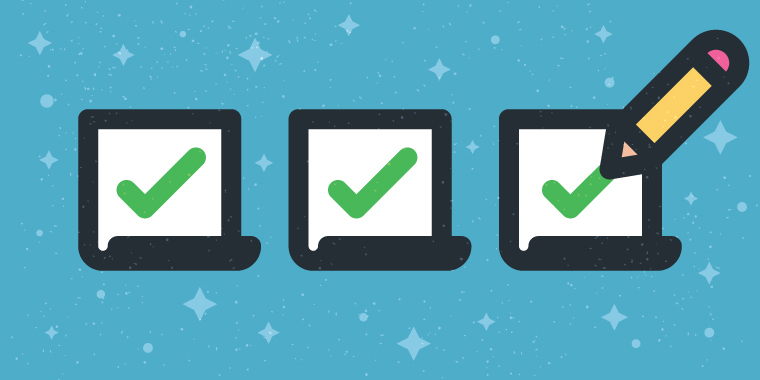 So let’s take a look at a few different ways you can use the checklist interaction in your next e-learning project. The checklist is a great way to present a to-do list. It could consist of the jobs an employee needs to complete for a meeting, a list of work tasks for the day, and so on. You can set up your checklist so learners complete items in a specific order, or build it so learners can click through the checklist at their leisure. Do you have static information to share with learners, but feel like your slide’s looking pretty ho-hum? Instead of showing a few boring blocks of text, use the checklist interaction to make it more fun and interactive. You can document any type of step-by-step procedure with the checklist interaction. If you need learners to follow the steps in a certain order, you can set the checklist properties so they can only proceed in that sequence. Those are just three easy ways you can incorporate a checklist interaction into your next course design. Do you have other ideas for ways to use a checklist? Please leave a comment below to share your ideas with the community. And if you’d like more tips and tricks about e-learning, please follow us on Twitter. I love checklists-that is what people need quick, short lists of how to do something, what to reference etc. You could use this to show parts of a form and how to complete each section of the form. Do you ever think there are too many engage interactions in one module? I have a module which is informational about each Bureau in our Department. I created an engage interaction of the same type for each Bureau with a different color scheme for each one. There are about 5 main Bureaus and then several units or offices in each Bureau. Let me know what you think. Thanks! Download free e‑books on all things e‑learning. Create compelling e‑learning courses with stunningly simple, remarkably powerful software from Articulate. © 2019 Articulate Global, Inc. All rights reserved. You can try again or reset it. Your account has been blocked after multiple consecutive sign in attempts. We've sent you an email with instructions on how to unblock it. There was an unknown error logging you in. Please wait 5 minutes for your email and try again. We've upgraded your E‑Learning Heroes account with an Articulate ID. To sign in, you'll need to update your password. Learn more about Articulate ID. Before you can sign in with your new Articulate ID, you must verify your email. If you still don't receive the email, please contact our ace support team. You'll need an Articulate ID to join discussions, download free content, and get free software trials. Looks like you already have an Articulate ID. Would you like to sign in instead? Or contact support if you're having trouble. Password should be at least 8 characters long and contain a lowercase letter, an uppercase letter, and a number. Please verify your email address before you sign in. Sorry, we couldn't find an Articulate ID with that email address. Please check your spelling and try again. There was an unknown error resetting your password. We'll have you up and running in no time. Please enter your email address. Click the link we just sent you to reset your password. If you didn’t receive the email, please contact us.